The second day of talks between Iran and world powers over Tehran’s nuclear program failed to break the deadlock in the crisis. Saturday's second day of talks between Iran and world powers over Tehran’s nuclear program failed to break the deadlock in the crisis, AFP reported. EU foreign policy chief Catherine Ashton said the positions were still "far apart." The first day of talks in Kazakhstan on Friday saw Tehran being criticized for failing to give a clear response to a proposal aimed at breaking the deadlock. Iran presented a plan of its own, which Western officials said was just a rehash of old ideas that had already been cast aside at a meeting last year in Moscow. After two days of exhausting diplomacy in the Kazakh city of Almaty, no new date was agreed for the resumption of talks searching for an elusive breakthrough after more than a decade of tensions, reported AFP. "It is fair to say that Iran is willing to take very limited steps on its nuclear program while expecting very significant results in return," a senior U.S. official said on condition of anonymity. "They put forward some minimal ideas but expected a great return and a quite disproportionate return." Iran's chief nuclear negotiator Saeed Jalili praised the talks as "comprehensive" but indicated that Tehran wanted to see more put on the table by the world powers to "gain the confidence" of the Iranian people. The world powers had offered some easing of the sanctions that have hurt Iran's economy in the past two years in return for Tehran accepting limits on its nuclear program. But speaking after the talks wrapped up, Ashton admitted that the world powers were still waiting to see "real engagement" from Iran over their proposal. "It became clear that the positions (of the world powers) and Iran remain far apart on the substance," Ashton told reporters, according to AFP. Unlike at the previous round of talks in Almaty in February which ended more cordially, the two sides did not agree a time and a place to hold the next meeting. Instead, Ashton said the sides had decided to go back to their capitals to discuss what to do next and promised that she would be in touch with Jalili. The U.S. official said Ashton would be calling Jalili within a matter of days, adding that the talks were much more substantive than they had been in the past. "It was really a lot of give and take -- quite different from the last times. But you still have to get to the substance. The substance is not there yet," the U.S. official said. 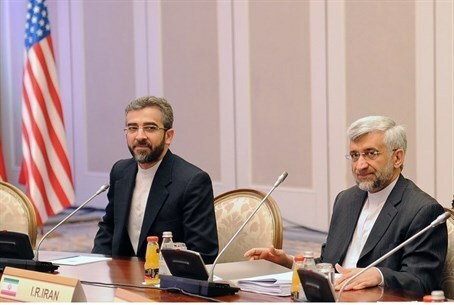 Jalili offered little hope of Iran offering concessions on the main sticking point in the talks -- Tehran's insistence on its right to enrich uranium on its soil. "Now they (the world powers) must work to gain the confidence of the Iranian people," said Jalili, a hardline conservative close to Iran's supreme leader Ayatollah Ali Khamenei. "We believe that the right to enrich is an inalienable right of the Iranian people -- whether we are talking about (to a level of) five percent or 20 percent," Jalili said, according to AFP. "Trust building should not deprive and deny the right of a nation but should be based on mutual cooperation," he added. Minister of Strategic and Intelligence Affairs and International Relations Dr. Yuval Steinitz, who is responsible for coordinating the international campaign regarding Iran, said Saturday evening that the failure of the latest round of talks with Iran was not surprising, since Iran is merely playing for time. "This failure was predictable," Steinitz said in an official statement. "Israel has already warned that the Iranians are exploiting the talks in order to play for time while making additional progress in enriching uranium for an atomic bomb. "Israel believes that without a significant and tangible threat, including a short timetable, it is clear that achieving the dismantling of the nuclear project will not be possible. The time has come for the world to take a more assertive stand and make it unequivocally clear to the Iranians that the negotiations games have run their course."